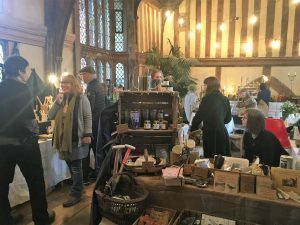 The past two weekends have seen Great Dixter house and garden in Northiam open its doors, gates, nursery and grounds to the annual Christmas Fair and the winter Friends event. The house and garden are closed for the winter from the end of October until the beginning of April, although the nursery remains open all year round, except for Christmas Day, but two special events swung wide the great door and the garden entrance to welcome visitors to the property. 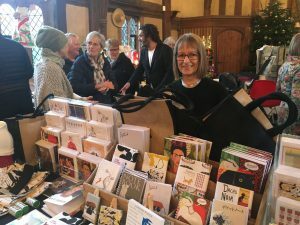 The first event, over the weekend of November 24 and 25, was the Christmas fair. During the two days, about a thousand visitors came to see the artisan stalls in the house and be greeted with a glass of mulled apple juice at the entrance. This year, there were some new stallholders, one of which was directed at ‘ all crazy dachshund lovers’ and in view of the continuing line of dachshunds owned by the family and staff, seemed entirely appropriate. Annie Soudain showed her bright, life-enhancing, clever prints and the sock lady, who sells bamboo socks as well as wool and cashmere, in a wonderful array of colours, did remarkably well, possibly because of the awful wet weather. The second event, on Sunday, December 2, saw more than 150 Friends of Great Dixter come to hear several speakers. Fergus Garrett, Chief Executive of the charitable trust and head gardener, talked about the garden; there was bulb potting up and planting in the Great Barn; Michael Waechter, one of the gardeners was holding a seminar in the house and Olivia Eller, Daisy and Nathaniel Lloyd’s granddaughter, displayed some of the textiles and clothes made so exquisitely by her grandmother, and talked about her life. Nathaniel and Daisy Llloyd were Christopher Lloyd’s parents and it is he who last lived in the house and made the gardens so famous. His parents had six children, the only girl, Letitia, being Olivia’s mother. This was completely different to the emphasis usually given to the gardens and nursery, and the artefacts, textiles and clothes had mostly not been seen out before. The people listening had the opportunity to walk round with Olivia and hear about individual pieces made by all the family members. 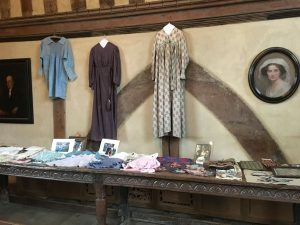 Daisy, a Victorian mother who believed every moment should be usefully occupied, taught all the five boys and a girl to sew, otherwise, in her view, they were “ half educated”. The house and garden will open to the public again at the beginning of April, go to the website for further information. To become a Friend and benefit from free entry for the member and a companion, special events and a newsletter and winter entry to the garden, information and costs will be found on the website menu ‘Support Us ‘.